The Safire™ Firing Furnace with DriTech™ Dryer is designed with advanced features and technologies that ensure superior stability, repeatability and cell efficiency in a high capacity platform. 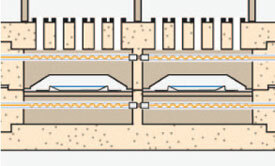 The Safireâ€™s twin chamber design features two independently controlled furnaces which eliminates the lane-to-lane influence found in traditional dual-lane furnaces. Microzone™ Technology provides the ability to precisely tailor thermal profiles around advanced materials and architectures. SolectFireTM enables independent top/bottom temperature control enables optimized frontside and backside firing. The DriTech™ Dryer is designed for a fast peak thermal profile that delivers maximum VOC release at an early stage resulting in maximum paste drying efficiency. The dryerâ€™s thermal oxidizer ensures that VOCs are removed to prevent furnace and facility contamination. The Safire now features PowerLock™ technology which suppresses LID on PERC cells from 3-6% down to ~1%. The system is integrated into the Safire resulting in a small footprint and no material handling. PowerLock uses LED light that provide twice the lumens per watt and ten times longer life compared to the arc lamps used in other systems on the market.